A new public campaign has been launched nationwide by China Customs and the National Forestry and Grasslands Administration (NFGA) with non-profit organizations WildAid and the World Wildlife Fund (WWF), aiming to reinforce the ivory ban in tourism ahead of the upcoming Spring Festival holiday season. "China has set an example for the world in wildlife protection and shown the determination of a responsible stakeholder in the world," said Dr. Sun Quanhui, science officer of World Animal Protection, a United Nations general consultative organization. Since domestic sales of ivory were banned in China, there's been a clear decline in illegal sales and demand for ivory on the mainland, according to surveys released by TRAFFIC, a leading NGO working globally on trade in wild animals and plants in the context of both biodiversity conservation and sustainable development, and WWF in September 2018. Several months after the ban was enacted, 90 percent of those surveyed stated support for the ban, and within 12 months ivory consumption had decreased significantly, WildAid reported. Twelve percent of respondents claim to have purchased ivory in the first six months since the ban, compared with 26 percent of respondents who reported doing so in a pre-ban survey in 2017, a 54 percent decline, the TRAFFIC-WWF survey shows. "China's ivory ban shows the determination of a responsible nation and sets an example for the world in wildlife protection ... The ban was the most extraordinary measure to protect wild elephants," Sun said. WildAid also praised China's efforts in enforcing the ban on both domestic and international levels. In 2018, NFGA had worked with diplomatic, cultural, customs and market surveillance departments to carry out inspections and promotions in major municipalities and provinces including Beijing, Tianjin, Hubei, Yunnan, Fujian, Zhejiang and Guangdong. Chinese authorities including NFGA and customs have collaborated on organizing campaigns in African countries such as Tanzania, Mozambique, Zambia, Uganda and Ethiopia, urging the public to stay away from the illegal trade of wildlife products. A number of international organized criminal groups were busted during the joint actions. 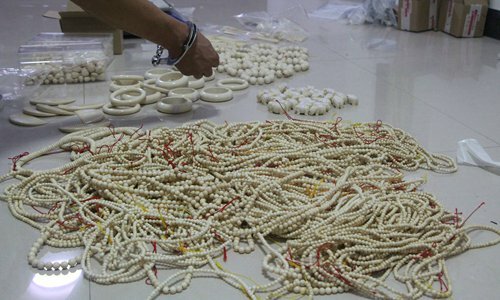 In July 2017, two major ivory trafficking rings were dismantled with 22 suspects arrested in Maoming and Putian, in the southern provinces of Guangdong and Fujian. They were accused of smuggling tons of ivory worth over 100 million yuan ($14.7 million) from Africa through China's neighboring countries. It has been proven in practice that only by cutting and restraining market demand for wildlife products can endangered species be protected effectively. Early this week, a new campaign reminding outbound tourists not to purchase ivory products was launched jointly by China Customs, NFGA, WildAid and WWF. The campaign warns that "souvenirs could be contraband." One study shows that more than 18 percent of outbound travelers bought ivory products on trips abroad, with Thailand and Hong Kong being the top two markets.